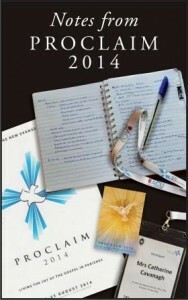 In August 2014 bishops, clergy, religious and lay people came to Chatswood from all parts of Australia and beyond to grapple with the question of how to implement the vision of Pope Francis at a parish level. He wants us to be missionary disciples actively engaged with those on the fringes of church life. That is a far cry from the ‘business as usual’ ‘build it and they will come’ way that most of our parishes operate. Finding the stepping stones to get parishes from where they are to where they are called to be is the challenge facing us. At the Proclaim 2014 Conference participants heard from those who are a few stepping stones ahead on the way, and came away inspired and encouraged. But only a few hundred people were able to attend the full three days of the conference, and not everyone has the patience to watch all the video clips and listen to all the podcasts on the conference website. However time-poor people can dip into a few pages of Conference notes from an e-book and find at least one good idea to chew on, and then come back to find another good idea when the next 5 minutes of unallocated time comes along. The first key note speech was about how to make church matter and about how to stop using your energy on projects that don’t bring people closer to God. The workshop on disability and inclusion might sound boring, but it had the most profound effect and has lingered most in the memory. The workshop on the essential subject matter for preaching challenged us to start doing what St Paul found so effective – preaching a crucified Christ. The workshop on the process of Christian initiation for adults and how to keep newly initiated Christians engaged with the parish afterwards was excellent. The second key note speech which unpacked data from the National Church Life Survey and explained the implications was eye-opening. Having an idea about the gender, age, and marital status of the person most statistically likely to consider taking God seriously is powerful stuff. Knowing that in any parish there is a constant percentage of members who could become gifted evangelists with a little training is cause for both celebration and action plans. The ecumenical panel about what is, and is not, working in other churches was a reminder that we all face similar challenges and have a lot to learn from each other. The workshop on leadership, taking Pope Francis as a model, and seeing what we could learn from him showed us the impact of holiness and ministry that is not ‘at a distance’. The third keynote speech was about how to move members from consumers to contributors, and about how to make it easier for them to take that step. If you are convinced that the definition of insanity (doing the same things over and over again and expecting better results) applies to parish life, and that unless we start doing things differently we may not have a parish at all when our members in their 70s, 80s and 90s have attained their eternal reward, then ‘Notes from Proclaim 2014’ is for you. The inspiration came from the desire for the content of this Conference to find a much wider audience. That began with typing up the Conference notes talk by talk, and sharing them with family, friends and others I met at the conference. They were received well. For those whose who didn’t want their inbox cluttered, the notes were made available on the blog. At least one friend expressed the wish to have those notes made sequential and keyword searchable in one place. Putting the notes into Kindle format made that possible, and permitted extra material like prayers and information on post Conference activities to be included. Music has the power to transport a person on an emotional, intellectual and spiritual journey. God has bestowed on His people the gift of song. God is present whenever His people sing. Music leads us to the higher realm of things. Music can do what words alone cannot do. More than anything else music can change hearts and minds for the better. Historically at The Nativity, the music was very bad. We had a choir Mass, a folk Mass and a quiet–no music Mass. The folk Mass was the most popular choice, but the music group struggled. Our choir was convinced that they had musical skills beyond where reality lay, and had a few prima donnas. And no one sang. No one. If you sang, we knew you were a visitor, and we would probably stare at you until you shut up. Most people were apathetic about their involvement in singing. At one of our town hall style ‘get feedback from the people’ meetings there was a riot of complaint about the music. People were coming to church, and leaving angry because of the music. What did we do? Nothing: Because we didn’t want to offend people. It is very difficult to change the music. To do so you must make the commitment and wear the consequences. There are very good musicians right now in your pews, who won’t step forward and haven’t stepped forward because there are other musicians (usually of lesser quality) in those spots. God gave us the courage and the grace to make changes in the area of music.